By Sadiq Umar – The Southern and Middle Belt Leaders forum (SMBL) on Friday rejected what it called the “illegal suspension” of Chief Justice of Nigeria (CJN), Walter Onnoghen, describing it as a “coup” against constitutional democracy. SMBL said the suspension is null and void and of no effect whatever, calling for its immediate reversal. President Muhammadu Buhari had earlier announced suspension of CJN Walter Onnoghen and sworn in, Justice Tanko Mohammed, as a replacement. 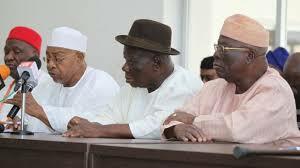 “This is a constitutional crisis foisted by desperation and morbid desire to foist rule of thumb..
“We have checked through the constitution and the President has no power to unilaterally suspend the CJN,” SMBL said in a statement jointly signed by Edwin K Clark, Ayo Adebanjo, John Nwodo and Pogu Bitrus, representing South South, South West, South East and Midddle Belt respectively. According to them, “Section 292 of the amended 1999 Constitution is clear that the President can only remove the CJN with 2/3 of Senate resolution. “To us what has been done is resort to self-help after the Court of Appeal issued an order stopping the trial of the CJN by the CCT presided over by a man answering charges in court over corruption allegations but still in office. “The latest action is a clear suspension of the constitution and enthronement of full-blown dictatorship. “An emergency meeting of the Forum holds shortly on this total aberration. “We call on all Nigerians to wake up to the reality that our democracy is now under threat and use all constitutional means to defend it. We must not surrender to this authoritarian rule,” it added.